Is it safe to do CPR and use an AED on a woman who is pregnant? We recently had a question posed as a comment on our blog post FAQ: AED use on Infants and Children which asked if you can use an AED on someone during their first or second trimester of pregnancy. We felt this topic was worth a post of its own as others may have the same question. As we have stated many times in the past, sudden cardiac arrest (SCA) does not discriminate and can happen to anyone, at any time, regardless of age, ethnicity, gender or physical fitness. This includes women who are pregnant. So the question is whether it’s “safe” to use an AED on someone while they are pregnant and will it harm the baby? Keep in mind someone in sudden cardiac arrest is technically dead. No blood is being moved through the body because the heart is quivering (in fibrillation) and not pumping. That is why the person has collapsed and is not breathing or responding. There is a limited supply of oxygenated blood remaining in the body which is why immediate CPR is crucial to someone regaining full neurological recovery if they are resuscitated. CPR moves the oxygenated blood to the brain and vital organs. The heart will not regain its normal rhythm unless it is defibrillated either by use of an AED or a professional defibrillator. If you come across a pregnant woman who is not breathing and unresponsive, the bottom line is to treat her as you would anyone else in this condition. Begin the chain of survival by calling 911, get an AED or send someone for an AED and begin immediate CPR compressions. Once the AED arrives, turn it on and follow the instructions. Our resident EMS expert and CPR instructor stresses a woman in SCA will not survive, and her baby will not survive, unless these steps are taken. If the woman does not appear pregnant (in her first or early second trimester), but you are aware of the pregnancy, you should let the 911 operator know of her condition so both EMS workers and hospital staff are aware as well. If she is obviously pregnant, there is a chance the mother may not make it but the baby could. Letting the 911 operator know will allow EMS to prepare for the special circumstances present in a late-term pregnancy, and emergency room staff can prepare for a possible emergency C-section. 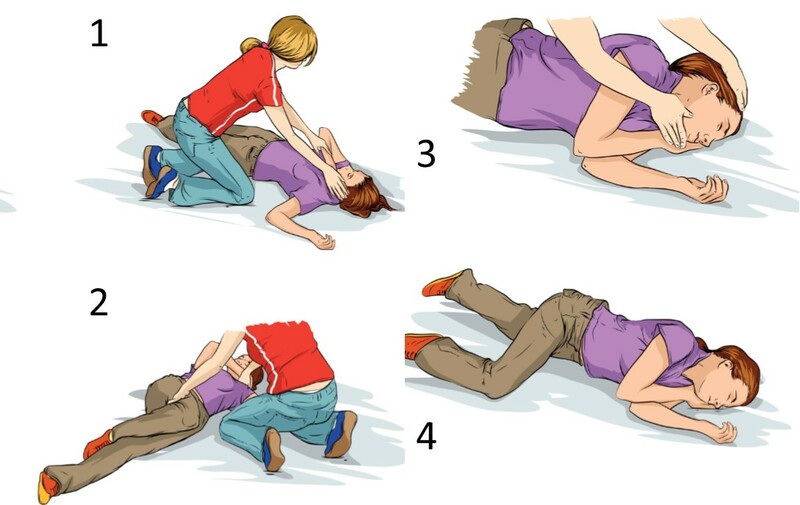 Place the patient on their left side in the recovery position if they regain consciousness. Continue CPR and AED analysis/shocks until EMS arrives and takes over. Should the patient regain consciousness before EMS arrives, and there is no evidence of trauma (for example broken bones or spinal injuries as may be suffered during a vehicle or other accident/incident), place the patient on her left side in the recovery position. (See illustration.) This will allow optimal blood flow to both mother and fetus. For more in-depth procedural explanations, the American Heart Association issued their formal Scientific Statement in October of 2015 with regard to initial and advanced care and recovery of a pregnant patient in sudden cardiac arrest. Illustration shows patient on right side? Oh my gosh! You’re right! Will fix. Thanks for catching that!